Just kidding! 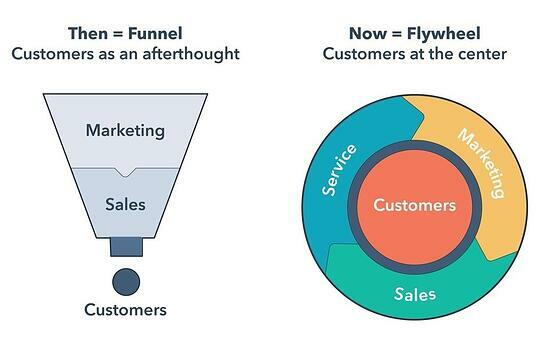 Your marketing funnel is alive and well, but in today's exceptionally buyer-centric environment,the flywheel effect is well underway. It's become apparent that the funnel prioritized marketing and sales over customer service, as it favored closing the next deal over your existing customers. However, when buyers wield the power and your Customer Acquisition Cost (CAC) is skyrocketing, your existing customer relationships shouldn't take this backseat. If you want to grow effectively, you need to "ditch" the funnel and introduce the marketing flywheel as a new way to think about your customer base. While you still need the combination of the marketing funnel and inbound methodology to attract visitors and initially convert them into customers, you now need to consider how these customers interact with your business at every stage. That's a consideration best made using the marketing flywheel as a guide. If you take nothing else from this blog post, remember that the marketing funnel sets you up to believe a customer can only purchase once, where the flywheel demonstrates the opportunity for repeat business. By utilizing client marketing best practices, your marketing team can continue engaging with existing customers. This engagement keeps the prospect (now customer!) coming back around the flywheel for additional products and services or to renew their current ones. With purchasing power in the hands of the buyer, your customers have become better marketers than you. Consumers are almost as skeptical of salespeople as they are of advertisements. According to HubSpot Research, businesses report that word-of-mouth is their best source of referrals. You can no longer bring in new customers only to forget about them in pursuit of the next deal. Instead, you need to build meaningful relationships and put them at the center of your organization (and flywheel). If you foster successful partnerships rather than ignoring your customers, they will help power your growth through their invaluable recommendations. The final change the flywheel makes is boosting customer service up to equal standing with marketing and sales. However, where marketing and sales had to redefine their relationships with your customers, hopefully, your customer service team won't. If your CS team has been following the principles of customer loyalty, they've already been living in a flywheel world. It all comes down to reminding ourselves of the final stage of the inbound methodology: delight. Delight your customers with excellent service and watch your flywheel go around and around. So no, your marketing funnel isn't completely dead: you'll still use it to gain customers. But once you've secured your customers, you need to start placing them into the flywheel, which will better focus on their journey with you as customers — not as one-time only prospects.